As a woman, I find tricky dressing for the transition into summer even if this is my favourite season of the year. The weather is so interchangeable through spring and summer that it's difficult to know what to wear and when the weather will turn. 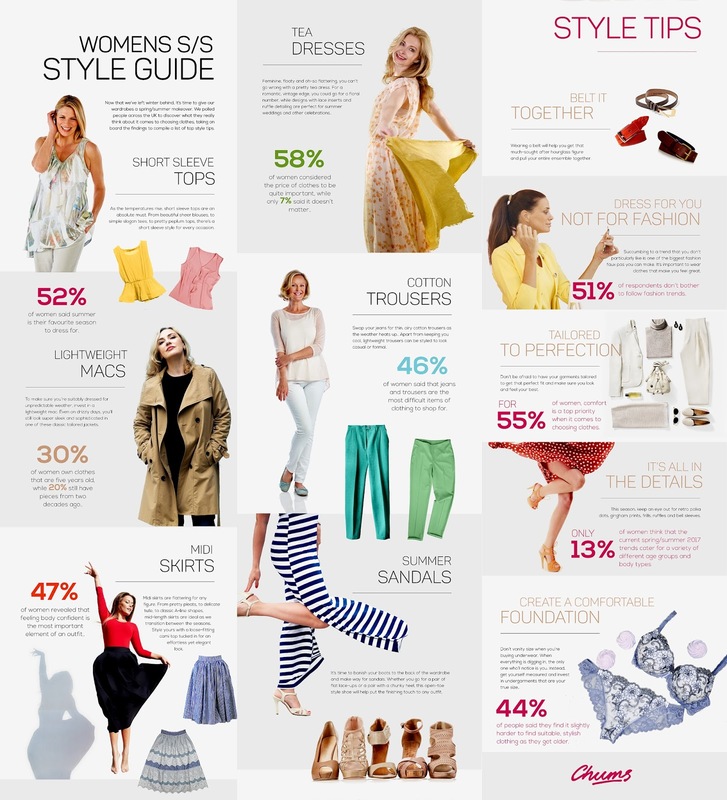 Chums did an infographic about Women's S/S Style Guide and also did some surveys where they found out that 63% of people surveyed consider comfort the most important aspect of clothing. The next important factor is price. Over half of women (52%) said their favourite season to dress for is summer. 1. Tea dresses and maxi dresses - they can be so chic, comfortable, colourful and feminine. 2. Womens elasticated waist trousers - one of my favourite items to wear. I feel so comfortable and it's easy to match to create a great outfit. 3. T-shirts - they are practical, I can wear colourful ones, with custom designs, florals etc. 4. Summer sandals - I am quite tall so I prefer to wear flat sandals. However, I must admit I would love to wear high heels more often. 5, Flats - if the weather it's tricky, these are perfect. 6. Summer cardigan - easy to match, great if it's a bit chilly outside. Of course, I have my own style so you can wear whatever makes you feel comfortable, feminine and happy with you. I'm curious if you have the tendency to keep your clothes more than five years or if you buy new clothes every year to be in trend. I admit I still have some old t-shirts and I like to wear them. Let's enjoy that summer it's almost here and don't forget #StyleisTimeless !! !